I remember a story I overheard or saw on television as a child when I was about ten years old. It was the 1970s, before lasers were available to remove tattoos. The story I heard was about a woman who wanted a heart-shaped tattoo removed from her derrière. Apparently the doctor incised the heart tattoo and stitched up the wound. The scar that the excision left was in the shape of a capital letter Y. I remember thinking to myself, “She better marry someone whose name starts with a Y, otherwise her husband might get jealous!” Something about that heart-turned-into-a-Y-shaped-scar always intrigued me. That woman had a story to tell! In the third grade, a broken femur set me on the path to scardom! 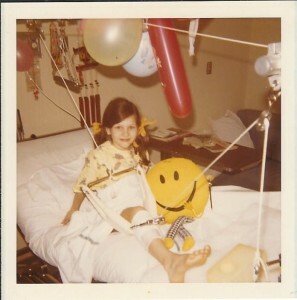 At age nine, I earned my own first noticeable scars when I broke my femur. My parents bought a small Suzuki motorcycle, and they’d take us kids out for rides on a piece of country property that our family owned. I was too young to ride the motorcycle alone, so I climbed on the back and hung on behind one of my father’s friends. It was an accident; Emile certainly didn’t want me to get hurt. But, a piece of barbed wire was dangling in our path, and it snared the wheel, yanking the bike onto my leg. I still remember the pain and the long drive to the hospital. The orthopedic surgeon inserted a metal pin through my leg to set me up for traction. After six weeks in the hospital, six weeks at home in a body cast, and several weeks on crutches, my femur finally healed. Over 40 years later, I still think about that accident whenever I see the small scars on either side of my right leg where the pin was. Most of us don’t like scars. Right? If you Google the word “scar,” numerous plastic surgery and dermatology websites for scar removal pop up. Apparently there’s a lot of money to be made in getting rid of our scars. Everyone wants beautiful, flawless skin that’s free of freckles, moles and wrinkles. But, if you think about it, scars equate to experiences. Every scar has a story. 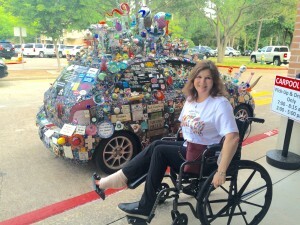 Without my stories—and my scars—who would I be? The memory of spending much of third grade in traction has stayed with me all these years. I remember feeling trapped in the body cast (i.e., itches I couldn’t scratch, places I couldn’t go, embarrassing moments I couldn’t escape). I remember being afraid to have the cast removed, because it kept me safely cocooned for so long. Later, my broken femur story inspired a college English essay, and the professor cited it to the class as “an example of an A+ paper.” My broken leg also led me to draft a children’s chapter book based on the experience (yet to be published). I acquired other scars over the years, too. There’s a small one on my knee from a cut I received in a high school car accident. I think of my friend Linda when I see that scar, because she was in the car with me. The car was totaled, but Linda and I were okay. In adulthood, two cesarean section deliveries left a thin zipper across my lower abdomen. My sons are the result of those childbirth experiences, and the scars remind me of bringing Mason (25) and Will (16) into the world. There’s also the one on my back where I had a benign skin cancer removed. The basal cell carcinoma was likely the result of childhood sunburns, and that scar brings back memories of a particularly hot family beach trip to Corpus Christie, Texas one summer. My most recent scar is fresh! Still healing. It runs up the back of my ankle, due to having a ruptured Achilles tendon surgically repaired two weeks ago. I was on a snow skiing vacation in Telluride, Colorado for Spring Break. I guess I was skiing to the right while a young man turned too fast to the left. Our skis crossed, and I flew out of control into some trees. It was a frightening experience, and I immediately felt intense heat throughout my ankle. I thought it was another broken leg bone, but I was wrong. It turned out to be a 6.5-centimeter tear in my Achilles tendon requiring immediate surgery. My scars aren’t so bad. They tell a story. They’re a literal skin road map of life that allows me to retrace my varied experiences. They reveal a sense of adventure. The scars also point out that I might be a bit clumsy! I don’t know yet what my new ankle scar looks like, but I’ll find out in a few days when the doctor unwraps the soft cast. I’ll laugh if it’s shaped like a capital letter Y. Tell me about your scars!